There are woodsheds, potting sheds, tool sheds, summer houses, huts, ‘lean-to’s, man caves and just, well…good old, fashioned shed sheds, but whatever these marvellous little garden creations are called, they have one very important thing in common. They consistently provide an invaluable source of refuge from the helter-skelter pace of modern life; somewhere, maybe for just a few hours a week where humanity can shut the door on a troubled world and indulge a favourite pastime or passion. In fact, over the past twenty years we have become a real nation of shed lovers, with a whole week now dedicated to the cause with healthy cash prizes for the most creative examples and numerous books written on the subject. Typically, of course, by their very nature and location, shed activities have always tended to be solitary but just imagine the fantastic opportunities presented by somehow harnessing all these shedders together in one communal site, not only to chew the fat, but share skills and knowledge and, at the same time, forge social connections, friendships and, of course, a healthy dose of humour for good measure. It was with this concept very much in mind that it’s believed sometime in the 1980s, a group of Australian miners first came up with idea of meeting on a regular basis for social and recreational activities as a means of improving general health and wellbeing. In 2007, the Australian Men in Sheds Association was formed to represent the movement, which had by then grown to incorporate several hundred individual groups. Soon the message had spread to as far away as Canada, USA, Finland, Greece and the UK where it caught the attention of former business consultant and many more things in between, Andi Saunders. He recalls: “I had reached a stage in life where I was looking to escape the rat race but still wanted to be active and contribute to the local community. I’ve always craved company but like a lot of people stepping away from the day-to-day business routine, you sort of wonder what is next. Continues Andi: “My friends and family will tell you that I’ve never been backwards in coming forward in asking for favours and we were able to gain access to a small shed which a local lady very kindly donated to us after her husband passed away. “This has subsequently been added to and, whilst it might appear a little chaotic, inside it would be the envy of a lot of commercial workshops. The guys, and there are now around thirty of us, meet up on Wednesdays and Thursdays and get involved in all sorts of local community projects. “There is a wealth of expertise amongst us to tackle all sorts of projects and we even have a weekly “bring and repair” session where locals come in with a broken item and we see if we can get it working again. It’s all non-profit making, we only ask for the cost of materials and a small discretionary donation. 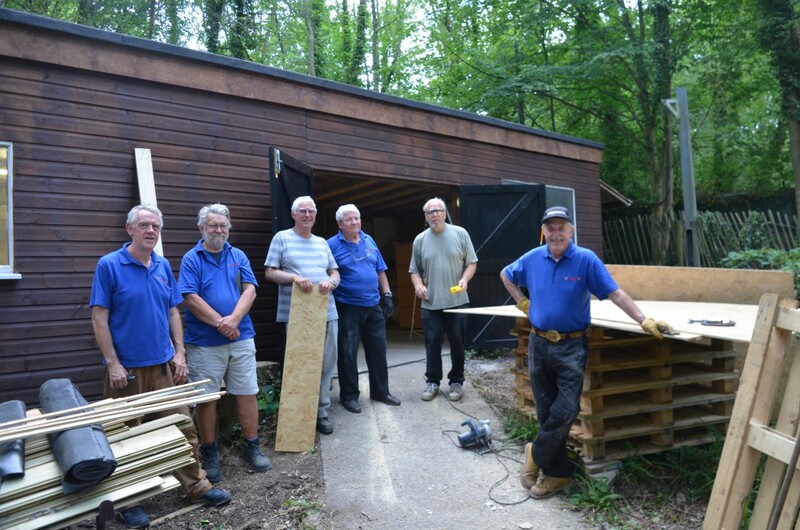 For the past six months Andi and his merry gang have been constructing a brand new shed within the confines of the old cricket army site in nearby Hamble. Once the home of four thousand wartime troops it’s hard to imagine a more peaceful setting, with extensive woodlands and regular wild visitors like deer and foxes to the site. “We were so fortunate in being able to secure this site from the local council and they have been most accommodating in allowing us access along the main driveway and utilising what we can find on site,” says Andi. “There is a major scout complex nearby and they have also been very kind in allowing us to use their facilities as the build progresses. We have a mix of trades from electricians to carpenters but, of course, with ages ranging from sixty-plus to eighty we go at our own pace and there are plenty of tea breaks. As Andi himself admits he is no shrinking violet and the Norbord donation was the result of him reacting quickest to a request in Professional Builder to let us know of a local project close to a reader’s heart where the highly versatile Sterling OSB would come in useful. 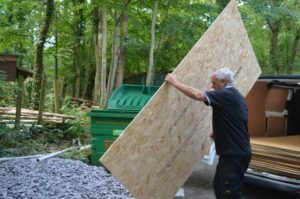 “I saw the piece and thought that whilst the material fitted the bill perfectly for the internal cladding, it would also present a great opportunity to get the Men in Sheds name out to a wider audience. “We are just one of more than 400 groups of ‘shedders’ currently in the UK and 100 are at the planning stage at any given time. Even so, there is still a vast untapped source of potential new members out there who could benefit by joining up. To this end the UK Men’s Shed Association which formed in 2013 is now a registered charity to provide more formal support to anyone who wants to get involved. “They liaise with other organisations, government authorities, businesses, other Men’s Shed Associations and related charities to help develop partnerships and generate funding opportunities. Although Eastleigh will almost certainly pride itself on having one of the best built and most well-equipped sheds in the UK, the meeting points are wherever members want them to be. They can be empty offices, portacabins, warehouses and in one case a disused mortuary! In fact, many don’t have premises at all to start with but instead form a group that meets regularly for social connection and company until they can find somewhere to kit out with tools. Many sheds play a key role in their local communities, restoring village features, helping maintain parks and greenspaces and building things for schools, libraries and individuals in need. Membership is predominantly retired men but some have younger men and women too. And that can only be a positive thing when more and more research is highlighting the negative impact of loneliness and isolation on a person’s health and well-being. Men typically find it harder to build social connections than women and have less of a network of friends to share concerns about health and personal worries. When retirement hits they can feel a personal identity and purpose lost. Thanks to the efforts of Eastleigh and many other similarly-minded individuals around the country, it seems those negatives are quite literally being shed on a daily basis.